I'm attaching an image showing roughly what the desktop looks like when it's locked. 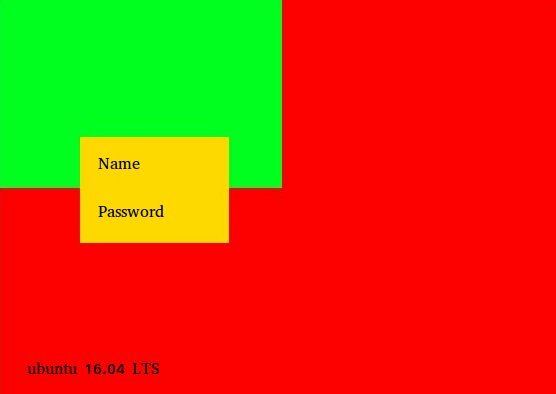 The green rectangle is the part covered by the purple wallpaper, the red is stuff that should not be visible when locked, and the yellow is the usual name/password entry box that is partially transparent. I'm marking this bug as a security vulnerability because it allows someone to see part of a user's desktop even when the desktop is locked. 5. Make sure the background is properly drawn. Make sure lockscreen background is drawn properly on an non-HiDPI monitor too. Also make sure that when using "draw-user-backgrounds == true" the background is properly drawn. Hi Łukasz, is this issue waiting on me? Please see my earlier comment https://bugs.launchpad.net/ubuntu/xenial/+source/unity/+bug/1666359/comments/4 . I can confirm this is fixed for me now with the recent updates. Thanks everyone!